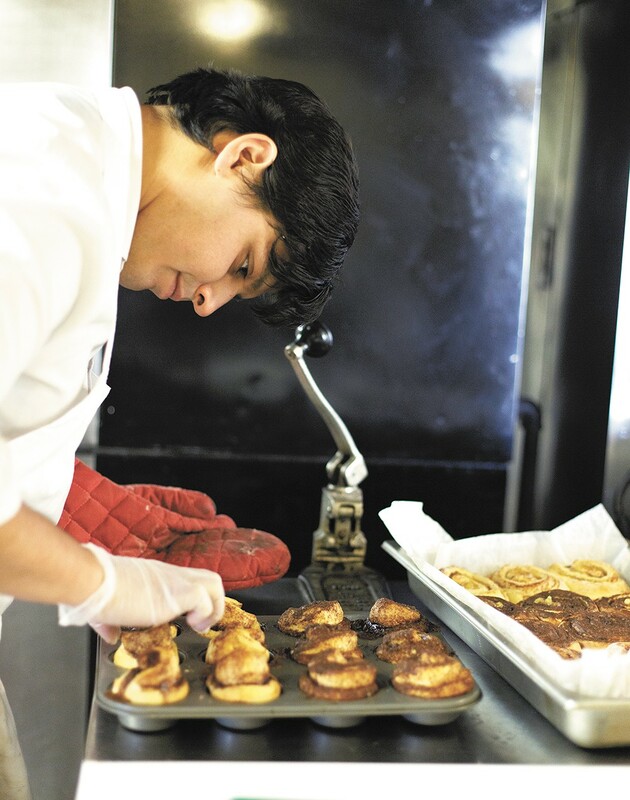 Clay Cerna, general manager of Sweetbox Delivery, works on his cinnamon rolls at Kitchen Spokane. Businesses are often created to fill a void — to give the community something it lacks, supply people with what they're looking for, and of course make money where it's not already being made. In Jayme Cozzetto's case, he worked in the restaurant industry as co-owner of Bangkok Thai and had friends calling him, asking if he knew of an incubator for small food businesses. He found nothing like that around, save for the Bonner Business Center in Sandpoint, which ended its run in September. So he decided to create one. "I'm about filling a need and a niche if I see a demand for it," says Cozzetto. After selling his interest in Bangkok Thai, he found an empty space on the fifth floor of the Comfort Inn on Third Avenue, where he brought in commercial kitchen equipment and started Kitchen Spokane, an incubator for small businesses to rent kitchen time by the hour. "It's unique because there are business incubators in town, but really nothing for the food and agriculture industry, so I wanted to develop something for them," he says. Everything from peanut brittle and chocolate to non-dairy cheese and Thai curry is being made in the kitchen, which is equipped with prep tables, a flattop grill, deep fryers, a six-burner oven, convection oven and a mixer. The space rents for $15 per hour and each client gets it to themselves during their time. They can also store items for about $3 per day in the dry storage space, refrigerator and walk-in freezer. Many of the 15 businesses that use Kitchen Spokane have been there since it first opened in February, says Cozzetto. There are caterers like Creative Catering and Scoe's Bar-B-Q, bakers like SweetBox Delivery, cooks like Somkhit's Authentic Thai and even a business creating dog treats called Malted Mutt. But Cozzetto says you don't have to be a business to use the kitchen. People who just want to perfect a family recipe can rent it, and you can come in for a one-time use. For example, marketing companies have rented for food product demonstrations and a wedding caterer came in last-minute when their facility lost power during a storm. "It's a kitchen that allows them to do what they want to do," he says. In September, Clay Cerna lost his job. He was the general manager of Dawn of the Donut when it was sold to a new owner and turned into Casual Friday Donuts. A friend referred him to Cozzetto, and just a few weeks later Cerna began baking batches of cinnamon rolls at Kitchen Spokane. His company, SweetBox Delivery, is less than a month old, but he's already supplying his cinnamon rolls to businesses around town. "If there wasn't this, I wouldn't be able to bounce back this fast," says Cerna. "The reality is, it's hard getting started." He says the biggest struggle in getting a new business up and running is acquiring equipment and space. "I love it here," Cerna says. "I will admit, from a business owner's standpoint, for everything you have to do, to have all this taken care of is really nice." If someone started a new business on their own, they would need to rent a space, be on the hook for a lease, pay for trash, Internet, electric and maintenance and acquire something akin to the $25,000 worth of equipment that's in Kitchen Spokane, says Cozzetto. "They're getting crippled for cost," he says. "There's just a tremendous amount of overhead." Being at Kitchen Spokane gives them a facility that's already approved with the health and agriculture departments, plus Cozzetto helps the businesses market and network. New business owners can avoid some of the hurdles they would normally experience on their own, maximize their profits and decide if the food industry is for them for a fraction of what it would normally cost. "It takes the risk out and makes it an attainable goal to have your own place someday," says Cozzetto. Kitchen Spokane has been so well received, it's already outgrown the 800 square feet at the Comfort Inn. In December, it'll move to a new space in Spokane Valley at 1014 N. Pines Road, a 2,500-square-foot facility that has a loading dock and will allow for expanded hours and multiple clients to work simultaneously. Cozzetto says he thinks it's wise for every large community to have a food business incubator because it's shortsighted not to, seeing as those small business can eventually become storefronts and contribute to the diversity of the food market in the city.